Tophats Farms	-50.25	Sent Payment 50.00 USD to account U17902413. Memo: Shopping Cart Payment. Deposit to Tophats Farms — Even Chickens Recommend Us! User ReyFors. The amount of 14 USD has been deposited to your account. Accounts: U17902413->U1*****. Memo: API Payment. Withdraw to *** from Tophats Farms — Even Chickens Recommend Us!.. Date: 09:24 03.02.19. Batch: 245190036. 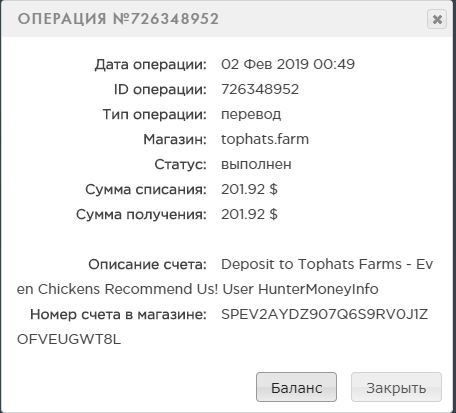 Tophats Farms	+2.5	Received Payment 2.5 USD from account U17902413. Memo: API Payment. Withdraw to ReyFors from Tophats Farms — Even Chickens Recommend Us!.